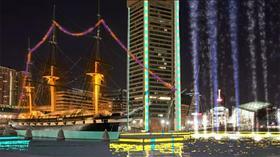 This year Baltimore’s Inner Harbor will debut a laser and light show to kick off the holiday season. From mid- November throughout December the Waterfront Partnership will host “It’s A Waterfront Life” light show. November 19th starts off the festivites with Power Plant laser show, parade, arrival of Santa Claus, music and light show in the harbor. Shows will run until December 31 on Sunday -Thursday at 6 p.m.,7 p.m., 8 p.m. and on Fridays and Saturdays at 6 p.m., 7 p.m., 8 p.m. and 9 p.m. The Waterfront Partnership will offer discounted parking at The Gallery Garage downtown and in Harbor East, where some parking will be free at select garages and $3 parking will be available on Caroline, Fleet and Eden streets. For more information on events, deals and discounts the group is offering throughout the campaign, visit the “It’s a Waterfront Life” website at www.itsawaterfrontlife.org. Plan your winter getaway! Bed & breakfast rooms and suites still available Friday and Saturday nights. Visit our specials page for last- minute discounts and enjoy the experience of a winter wonderland light show during this glorious time of year! !